Planning classes for this quarter has kept me busy the past couple of days. And today is the Valentine's/Occasions Mini Open House, so preps have been underway for that, too! One of the classes coming up is called Five Card "Stud" - Masculine Cards. Many people (myself included) struggle a bit with making cards for men, so I thought it would be fun to have a class devoted to all things manly; no frou-frou, no frills. Mary Fish has some wonderful ideas for masculine cards, so I CASEd her card here. The only changes I made were to run the More Mustard mat through the Big Shot with the Square Lattice embossing folder, substitute Night of Navy 5/8" Grosgrain Ribbon for the stamped panel, and use More Mustard brads instead of gold brads. Oh, and I changed the sentiment, too. This will be one of the five card we'll make in the class. Wanna join me? The class is Feb. 25th and at this point there are still openings. 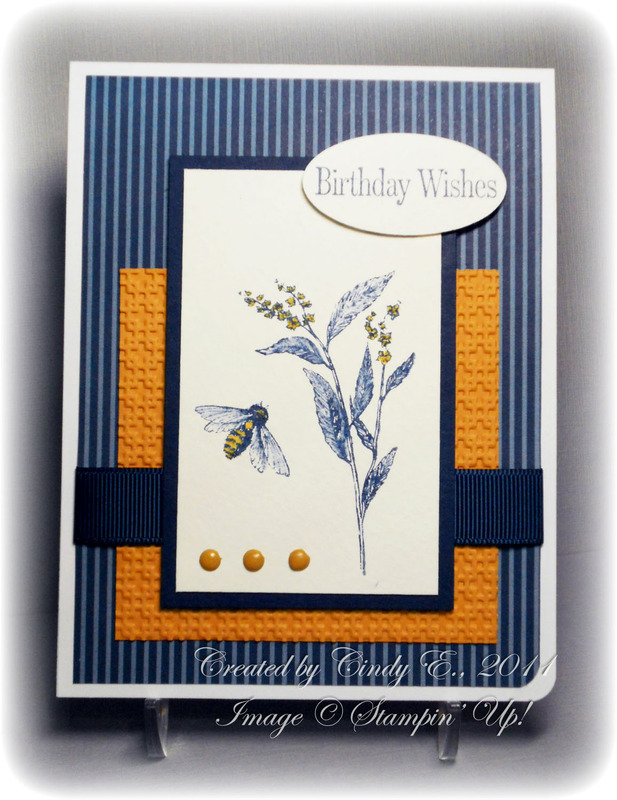 More details on this and other classes are available on my Stampin' Up! web site List of Events HERE. Great card! I love the added texture! Very nice masculine card. Those hare few and far between. Love the images, the coloring, and the texture! Beautiful! Best use of the bee I've seen so far. Oooh, this turned out so well! Love your coloring. OMGosh! I've just discovered your blog and I LOVE your style!! I'm an OWH'er and I'm so gonna CASE this; thanks! !